Tamarai is a pretty new tangle from German tangler Indrani Novello who has several other tangles on the site including the popular and lovely Amun. She writes that Tamarai, is the Tamil word for “lotus”. It was in her Amun tangle that we first learned of Indrani’s fascination with the lotus. Tamarai was inspired during a recent vacation which I spent at a resort. Every morning an employee would collect flowers from the tropical garden and then arrange them in a clay water bowl in all sorts of beautiful patterns. Tamarai begins with a grid of large and small orbs (dot grid) in Step 1. As much as I was trying to keep my focus, I found Step 2 to be a little confusing to execute. So I’ve deconstructed it a bit further for you. 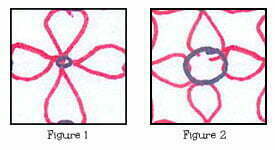 If you look closely at these blowups from Indrani’s Step 2, you’ll see that you either have a teardrop/leaf shape with the pointed end “growing” out of the small orb (Figure 1), or the same shape with the “fat” end attached to the large orb (Figure 2). Choose one of these and stick to it for Step 2. By selecting one of these two approaches, and sticking to it all the way, you shouldn’t have any problem getting Step 2 down easily. On the right you’ll see the first part of Step 2 done following Figure 1 above; the next step is to turn the tile and do Figure 1 again to complete Step 2. 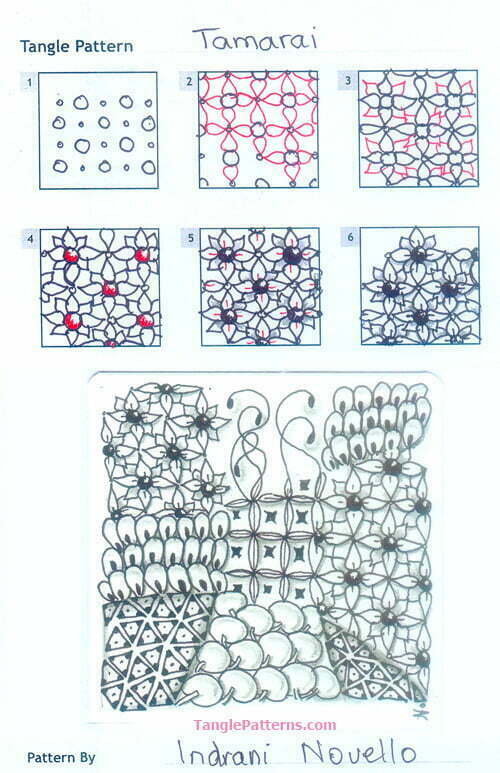 The shapes in Step 3 are then all “attached” to the large orbs which form the visual center of the motif. In an effort to make Tamarai more abstract and Zentangle-ish, for comparison I tried a couple of different ways of using solid ink and graphite fills to create emphasis. It’s so interesting to me how easy it is to alter the appearance of a tangle without really changing its structure at all. Indrani illustrates the step-by-step instructions for drawing Tamarai below and she features it in two pretty Zentangles together with some familiar Zentangle®-original tangles. 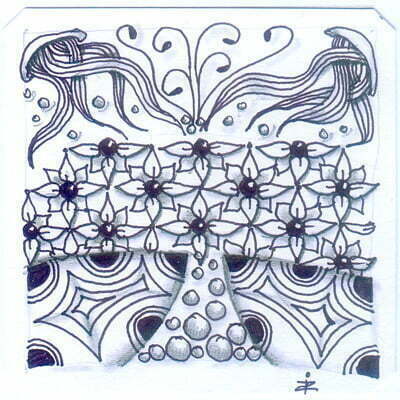 Here is Indrani’s second Zentangle featuring Tamarai. Check out the tag indranin for more of Indrani’s tangles on TanglePatterns.com. Very pretty tangle pattern. I will try it too. Thank you. A wonderfully meditative tangle to draw! Thank you Indrani! Thank you, Linda, for posting my pattern! And thanks Judy, Pam, and Jan for the positive comments!